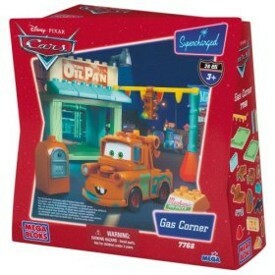 Mega Bloks Disney Pixar Cars Gas Corner playset is the perfect spot for the lovable tow truck Mater! Encourages the development of fine motor skills, color and shape recognition. Great starter kit for new builders. Ideal for ages 3 and up!